Books DVDs Post Cards and More! both made light their raison d’etre. LAKICH: For Light. For Love. For Life. 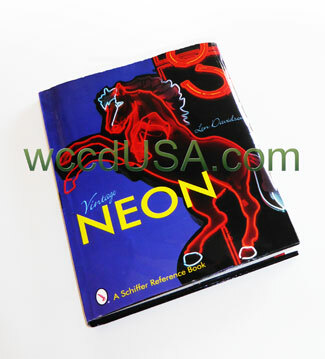 This must-have book is for working neon shop's to help solve problems and optimize the work place. This book presents ideas and methods to "tweak" your machinery as well as yourself to produce your best work. MORGAN CROOK is a mechanical engineer, tube bender and president of Neon Design, a wholesale, retail and consulting firm in Columbia, SC. 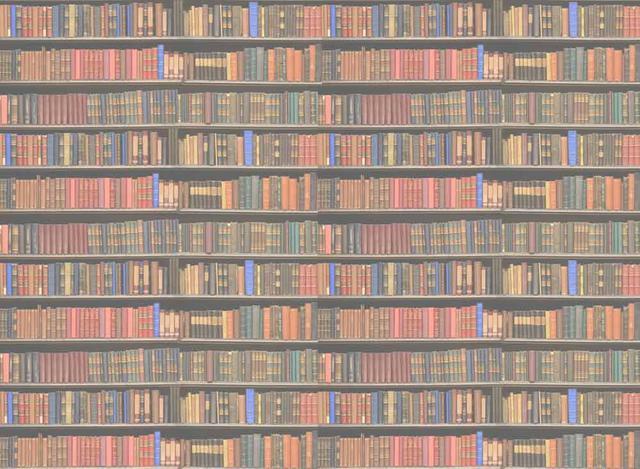 His writing has appeared in major trade periodicals more than a decade. In his professional capacity, Morgan has visited over 500 neon shops. 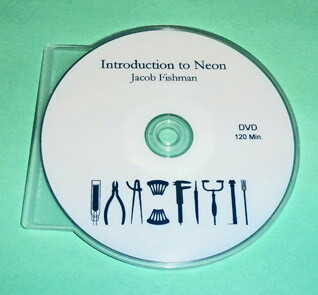 JACOB FISHMAN is an electrical engineer, artist and educator. His studio, Lightwriters, fabricates neon for film & theater, technical applications and traditional neon signs. The studio houses a workshop that teaches the art and science of neon construction and Lightwriters bookstore. Ton's of illustrations and black and white photos. Pumping Methods Second Edition Updated! Tube Life Second Edition Updated! Hotfil New Second Edition Info! Oven Pumping Second Edition Updated! Tipping Off Tips Second Edition Updated! 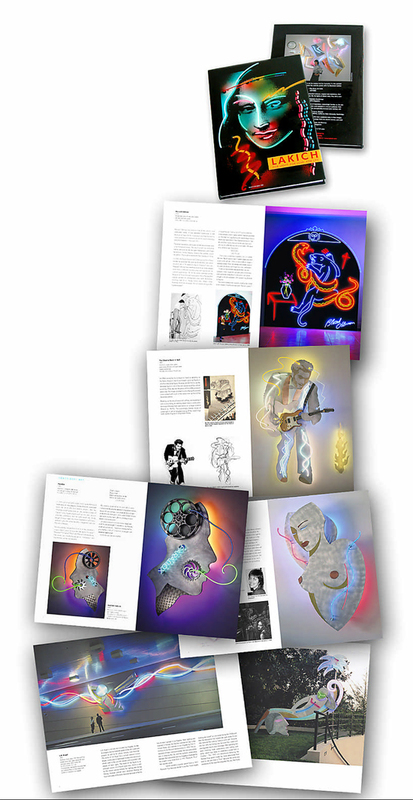 Glass Work for Neon Second Edition Updated! Lampworking for Neon New Second Edition Info! Hot Rod Crossfires Second Edition Updated! Borosilicate Glass Second Edition Updated! 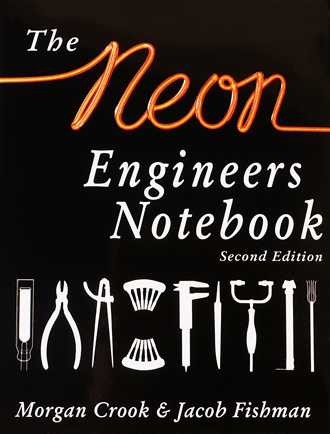 Using Neon Colors New Second Edition Info! History of Neon Color New Second Edition Info! Transformer Loading Second Edition Updated! Servicing 2161 Transformers New Second Edition Info! Time for Fun & Profit Second Edition Updated! Electronic Timers Second Edition Updated! Got MSDS? New Second Edition Info! Appendix New Second Edition Info! This professional video can help neon crafts people of all levels. 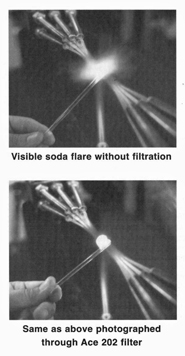 Step-by-step "real time" demonstrations show all the phases involved in the neon signmaking process: designing the neon pattern, tube bending, bombarding and pumping,and final assembly. Learn the craft of neon at your own pace with this highly detailed, two-hour video. What Fun! Set of 26 (25 + 1 bonus card) 4" x 6" collector post card set featuring restored vintage spectaculars, beloved American roadside favorites, as well as newer pictorial signs. 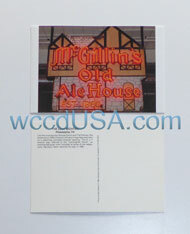 On the reverse side of each post card is a description of the sign and any additional information that was available. Below is a list of the included cards. During the middle of the 20th century, neon signs turned North America's roadside into a luminous wonderland. The most compelling signs were figural: imaginative, cartoon drawings in light. These unforgettable depictions of exploding bowling pins, crashing cars, baton twirling majorettes, and lassoing cowboys were the fodder for legend and lore. 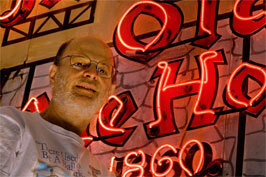 Neon designer Len Davidson has captured the magic with over 350 photos of superb vintage signs. He has drawn on renowned photographers, museums, and private collections, as well as his own Neon Museum of Philadelphia pieces to compile the definitive photo archive. Davidson has also expressed the legend in words. The pages echo with the voices of sign makers and shopkeepers, photographers and preservationists. Architects and sign artisans will find this collection invaluable. It is also an essential volume for anyone who has been captured by the spell of the highway and neon's siren song. 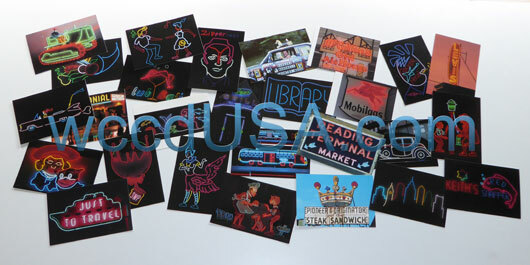 Davidson began collecting and restoring vintage neon signs in the mid-1970s, which led him to establish Davidson Neon Design, a custom sign business. In 1985, he founded the Neon Museum of Philadelphia to showcase his vast collection. Currently, Davidson lives with his wife Judy, in a house full of historic signs. 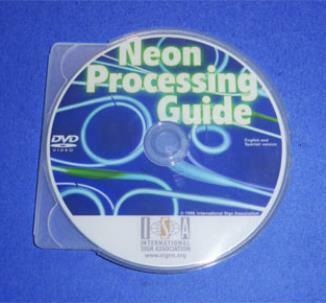 This instructional video demonstrates a variety of processing techniques. 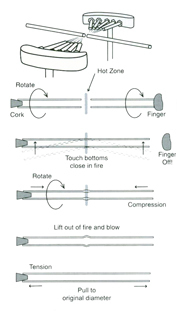 Produced by the ISA, Neon Processing Guide, minimizes the guesswork that goes into preparing and pumping neon tubes. 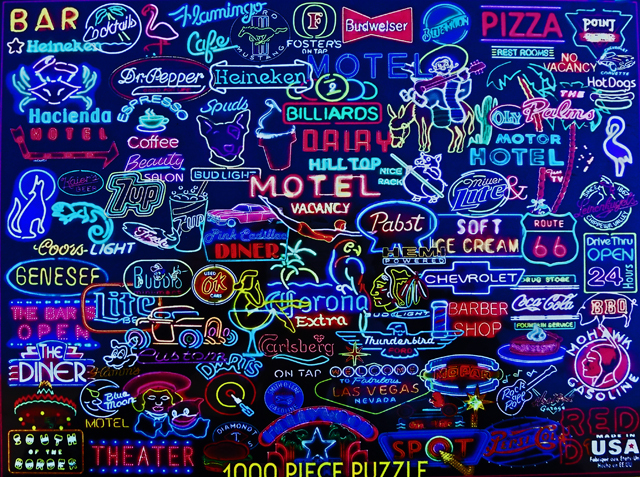 This 1000-piece Neon Sign jigsaw puzzle is way-cool! The finished puzzle is an impressive 24”x 30”. Designed by Artist Lewis T. Johnson. The puzzles are printed on blue chip board, which is a thicker and more high quality material than your regular imported puzzles. 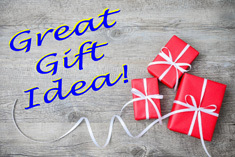 This also adds a comfortable heft to the pieces and provides additional sturdiness to keep your puzzles looking great for years to come. 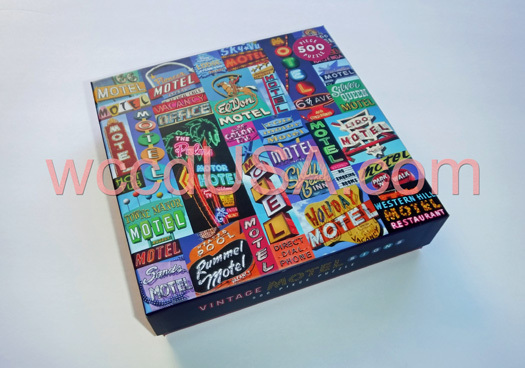 This 500-piece Vintage Motel Sign jigsaw puzzle is awesome! The finished puzzle is an impressive 20”x 20”. Designed by Artist Troy Litten. 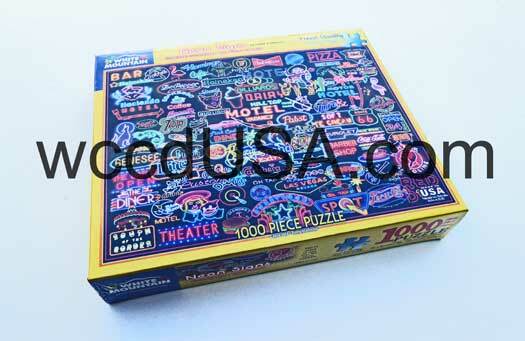 The puzzles are printed on 90% recycled paper and printed with nontoxic, soy-based inks. Designed in the good ol' USA!